Merry Christmas Jam Recipe so that you can surprise your loves ones this season with your homemade food gift. Not only the name but also the fruit jam’s flavor combination with spices will warm up your family and friend’s heart. If you are looking to gift a jar of homemade jam preserve for Christmas, I can recommend the Orange marmalade. I think the name, Merry Christmas Jam, is fun and totally suitable. 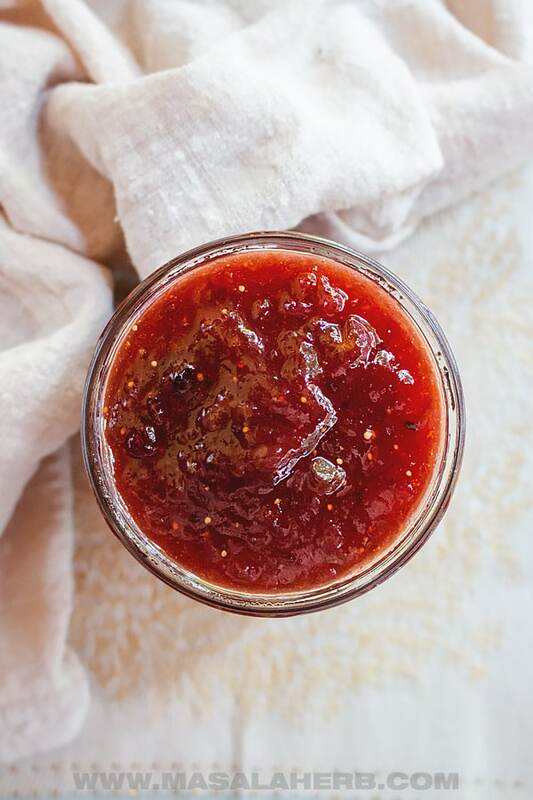 This Christmas Jam Recipe will get us all into Christmas mood, no matter if it’s snowing outside or not. The jam includes seasonal fruits and spices, which remind me personally of Christmas and all the food goodies that we tend to enjoy during that time of the year. I combined each ingredient, fresh fruits and spices, in such as way that they compliment each other to create a unique magical winter jam. I created the Christmas Jam Recipe by combining pears, plums, figs, and raisins, and because I want you to enjoy preparing your own batch, I haven’t set any fixed rules on the amounts for each fruit. However, I have fixed the total quantity of all the fruits, which gives you plenty of freedom to combine the amounts of each fruit the way you like. So, for example, I combined the fruits the following way: 30% Pears + 30% Plums + 30% Figs and the remaining 10% the Raisins. To turn this Jam into a Christmas delight, I add spices which will remind you of the holiday season. This includes green cardamom, star anise, and cinnamon. 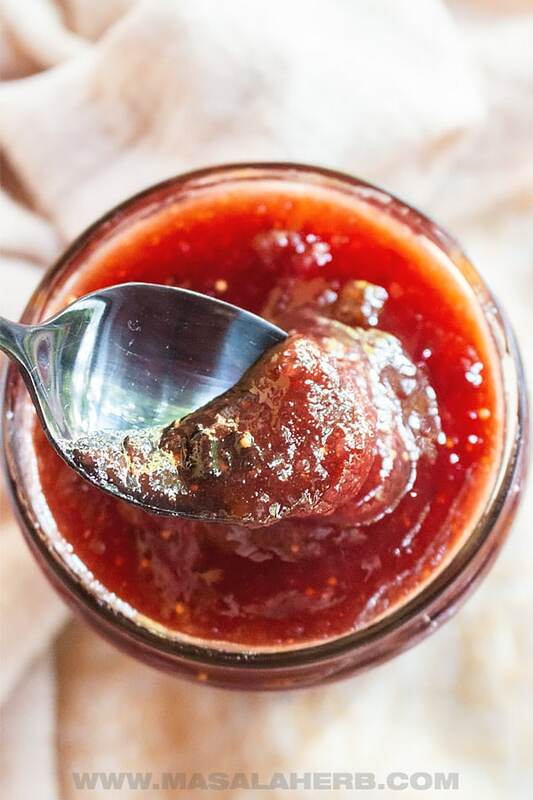 I think the combination of these 3 spices alone is more than enough to bring out the flavors of the fruits and to make you realize with each bite that the jam is magical. This Jam, as are all my jams, is prepared without pectin sugar because it’s based on the French way of preparing jam. Real regular sugar is used instead, which preserves the jam really well for many months. 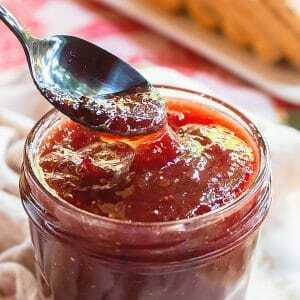 Please do not reduce the sugar quantity in this Christmas Jam Recipe, because the sugar is not only a sweetener but the main ingredient that preserves the fruits. How to make the Merry Christmas Jam? To prepare the jam is super easy and straightforward. Just follow the basic steps outlined, watch the quick video and read up the full recipe below with the ingredient quantity and complete instructions. Wash fruits, discard core of plums, and pears. Pour sugar over the fruits. Reduce heat and let simmer until jam thickens and sets. Setting point is 105 Celcius/220 Fahrenheit. Turn the hot jar with the jam in it upside down to create a vacuum. Leave the jar that way for 24 hours. Store in a cool and dry place. Keep in the fridge once opened. Basically, you can prepare a jam at home with just a simple large pot, a wooden spoon and some old glass jars with lids. It’s that simple. However, if you enjoy making jam and or you want to go all the comfortable way by using some tools, then I suggest you can some of the basics. For example, instead of a plain large stainless steel pot, you can get one of those fancy French copper pans. I’m saying fancy because they are for an outsiders perspective. In France, most countryside homes have a copper jam pan like this because it’s a family heirloom. I’m waiting for my mum to pass hers on to me. If you can afford one, get one too, please! It’s worth every penny! Another tool of the trade is a wide-mouth funnel so that you don’t make a mess when pouring the jam into the jars. I really should get one of these! When sterilizing jams, you will need a jar lifter to move the hot jars from A to B without contaminating them. You can boil the jars and lids in hot water to sterilize or place them into the oven to kill off all the germs. If you are new to cooking in jams without pectin sugar, I suggest you get hold of a reliable candy thermometer so to assist you with getting the setting temperature right. Merry Christmas Jam Recipe prepared with pears, plums, raisins, and fresh figs. The jam also includes some spices. 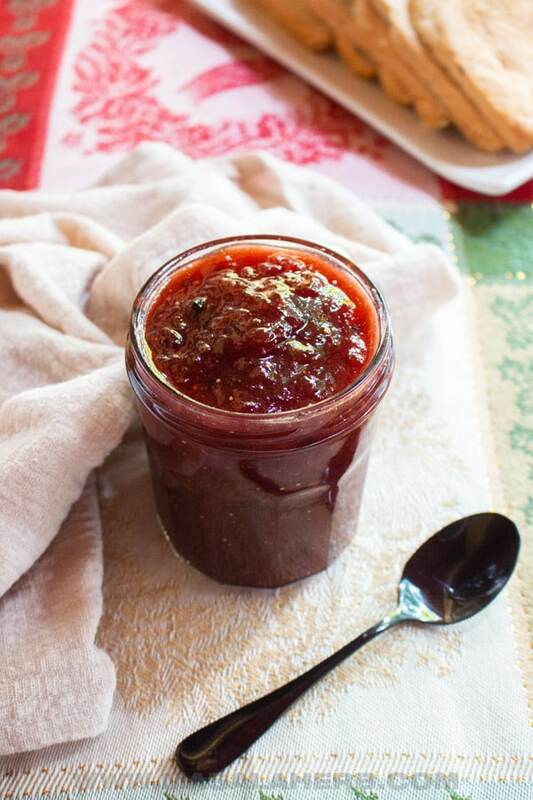 Each spoonful of jam will get you into Christmas mood! Magical for the heart. Keep a small plate in the freezer, this is to test the setting point of the jam later. Wash and sterilize your jam jars. For the jam, start by washing your fruits well. We won't peel them but take out the cores from the plums and pears. Cut your fruits into large chunks and place into a large jam cooking pot. Pour the sugar over the fruits and mix it all in. Take the fruits with sugar to the heat. Add the spices to the fruits with sugar. Make sure to smash open the cardamom pods so that the spice aroma is released into the jam. Bring your jam to a rolling boil (it will get super foamy). Take the heat down to a simmer. Stir occasionally and simmer on low heat for about 30 minutes until the jam is set. Jam setting temperature is 105 Celcius/220 Fahrenheit. 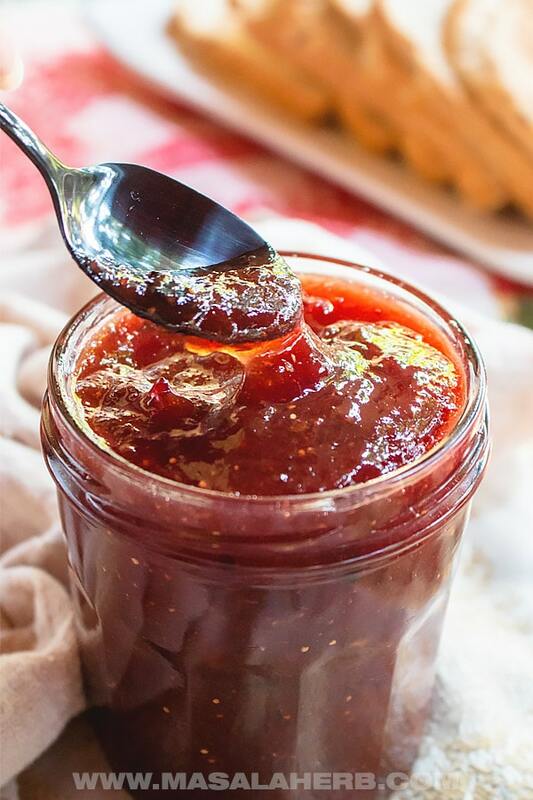 To make sure that your jam is set, test it by dropping some of the hot jam on the freezing cold jam. That way the jam cools down instantly and then only can you make out if it's running or set. The jam is ready when it's not running but set (please refer to video). Pick out all the spices and with a hand blender mash the jam smooth or semi-smooth. Pour the jam into the clean sterilized jam jars, up to the rim. Pour a drop or two of rum, whiskey or similar into the lid to add extra germ protection as this will prolong your jam's shelf life. Close the jar with the lids tight and turn it quickly upside down when it's still hot. This will create a suitable vacuum and your jam won't get moldy. Leave the jam like that for about 24 hours. Label your jam with jam name and date. Store in a cool and dry place. Keep in the fridge once opened. The fruits need to be 1 kilogram altogether. So you can use 300 grams plums, 300 grams pears, 300 grams fresh figs, and the remaining 100 grams raisins. Or adjust the number of fruits to your liking and let us know in the comments how you made yours. Use regular granule sugar or to pep up things brown sugar. Do not reduce the amount of sugar! This would ruin the jam and it will turn bad within weeks. The sugar preserves the fruits. Always use clean sterilizer jar and lids. Dear Readers, whom are you going to surprise with your homemade merry Christmas jam this season? 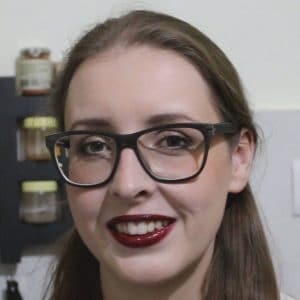 Hi, this may be interesting you: Merry Christmas Jam Recipe!